I'm documenting all of the steps required to go through a dual color analysis sequence for one of the #707 real-world use cases: colorimetric comparison! 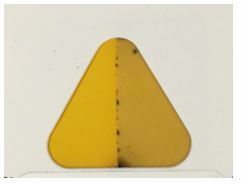 Working from this post, i found a sample image of a colorimetric badge that reacted to formaldehyde, where one side got darker over a few hours. Note: we assume that we can guide people to photograph the badge with consistent framing. That may be its own design challenge! We can show examples, and we can also show an overlay on the initial step's preview, so people can tell if their images are properly framed. My process was to crop the image so that we see only color from one of the two sides, so I used the crop module, but it had some bugs (that I think we can solve and then protect with better tests!). So, 130 for the left, and 500 for the right. Which can't be quite right! We could have the starting module trigger 2 sequences, one for left and one for right. Each crops, then averages. Once both are done, we compare, for example, the average red channel of each. We run the left side (crop and average), then use the import-image module to re-import the original image, then run the right side. At the end, we look back and fetch the outputs from the two average steps (left and right), and compare the red channels of each. In both case we display the ratio of the red channel (for example) between the two sides. Then, I think we can try making a new demo file in /examples/, which displays the ratio from the above process! Here is the "all in one sequence" approach! @jywarren what do you say about automating the input values of x and y instead of typing the coordinates. Like how about having a click and drag option. So you can click and drag until where you need to crop and when you do so the values of x and y will get updated automatically. at https://github.com/publiclab/SmART-Form we overlaid a semi-transparent image of the optimal placement of the badge over the camera feed to guide users (worked well in beta and field testing) and I think but am not sure that we had an auto-cropping. For the working demo, we should be able, as @shapironick says, to have an overlay to guide people. Thanks Nick. This would change for different types of colorimetric tests, but this is a good initial set to work with. And different tests might compare the 2 patches in different ways - how red they are, say, or how dark they are. The overlay would be pretty easy to add. The other thing we could do later is to add QR codes at 3 positions around the patches, and use those to auto-crop, to smooth things out even more. I would love to work upon it!!! Crop the left part and average the pixles of resulting image. Crop the right part and average the pixels of resulting image. Finally we can output the ratio of the red channel of both the results and display it to the user. Just want to ask one thing how can we display the ratio, like if we have to build some UI for it? Also I think meta-modules can be uselful for this use-case. I think we could do this in an independent demo, built on top of IS, and displaying in HTML the ratio output, instead of trying to build everything in -- and provide a really simple UI to help with this. But yeah, you have it right! Mostly at this point, we will need to debug and build good tests around the needed parts so that we can be sure we can rely on the system to be stable enough to support this application. Thanks!!! On Sun, Apr 7, 2019 at 5:33 PM Slytherin ***@***. ***> wrote: Hi @jywarren <https://github.com/jywarren> ! I would love to work upon it!!! So basically what I have understood from the previous discussions is that we can have a sequence defined in the sequencer where we can have the badge image set to following steps: 1. Crop the left part and average the pixles of resulting image. 2. Crop the right part and average the pixels of resulting image. 3. Finally we can output the ratio of the red channel of both the results and display it to the user. Just want to ask one thing how can we display the ratio, like if we have to build some UI for it? Also I think meta-modules can be uselful for this use-case. What do you think? — You are receiving this because you were mentioned. Reply to this email directly, view it on GitHub <#979 (comment)>, or mute the thread <https://github.com/notifications/unsubscribe-auth/AABfJ0XymaL12C7BhUzwPX4Y_tNKJTpnks5vemQagaJpZM4cZV8U> . @jywarren Yes, I believe making a separate micro service for this would be ideal. 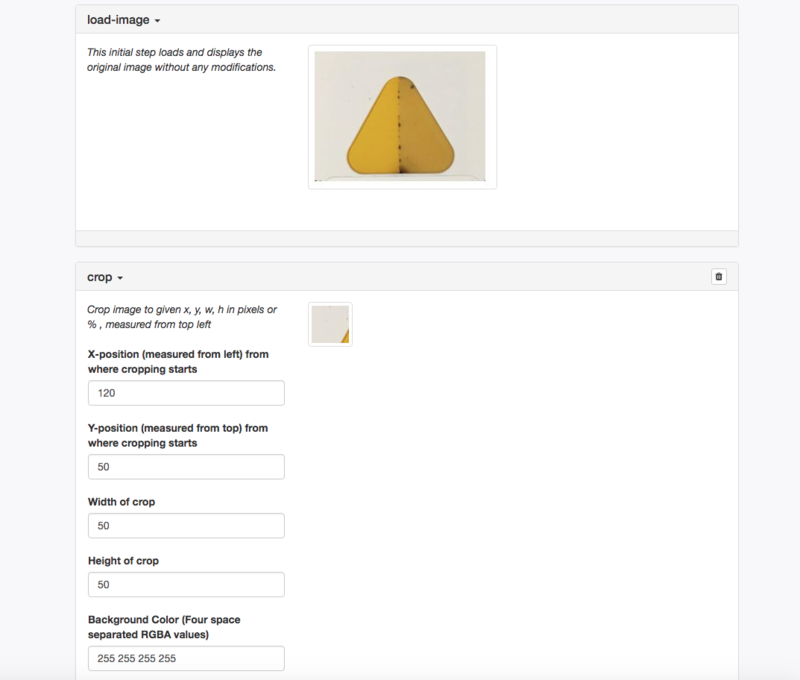 Passing in images (encoded or otherwise) and using two IS instances to process and then output the comparison would make this easy to implement AND easy to use. The first step to this would be fixing the crop module, I'll be on it as soon as I draft a proposal. Also, a little late on my SoC proposal, apologies! Will roll one out by the end of the day, and hope that I'm not already too late for your reviews! @jywarren I have made some changes to the proposal to include the calorimetric issue to my proposal which I really find is a strong use case for our organisation to proceed with. @jywarren proceeding further with this one. I think I can make a repo on github and make you a collaborator? Or if we can make a repo in Public Lab? Cool idea. Let's have a Public Lab repo, a separate colourimetry tool. @jywarren on your discretion, shall we collaborate? Sure, go ahead! This could also be developed as a sub-demo, at /examples/colorimetry/, if we want to... either way! On Thu, Apr 18, 2019 at 12:34 PM Slytherin ***@***. ***> wrote: Sure, we can collaborate.. — You are receiving this because you were mentioned. Reply to this email directly, view it on GitHub <#979 (comment)>, or mute the thread <https://github.com/notifications/unsubscribe-auth/AAAF6J7VU7YALNBZ6A4CINDPRCPHZANCNFSM4HDFL4KA> . @jywarren don't think we have access to creating a repo, you'll have to do that I'm afraid. On Thu, Apr 18, 2019 at 2:18 PM Vibhor Gupta ***@***. ***> wrote: @jywarren <https://github.com/jywarren> don't think we have access to creating a repo, you'll have to do that I'm afraid. — You are receiving this because you were mentioned. Reply to this email directly, view it on GitHub <#979 (comment)>, or mute the thread <https://github.com/notifications/unsubscribe-auth/AAAF6JYAXFN7QTOA63CJZU3PRC3OVANCNFSM4HDFL4KA> . This is just the name of thr repo right? Doesn't have to be technical? Should it have the colorimetry in its name or can it be called something like rainbowmetry.js? :-) yeah we can also name an "app" or "website" differently later. I like the idea... maybe we should keep it basic until we know more about it, and we can call it `colorimetry` for now. On Thu, Apr 18, 2019 at 3:35 PM Harsh Khandeparkar ***@***. ***> wrote: This is just the name of thr repo right? Doesn't have to be technical? Should it have the colorimetry in its name or can it be called something like rainbowmetry.js? — You are receiving this because you were mentioned. Reply to this email directly, view it on GitHub <#979 (comment)>, or mute the thread <https://github.com/notifications/unsubscribe-auth/AAAF6J6OEPOBT54U5UP7JE3PRDEN3ANCNFSM4HDFL4KA> . After loadidng image, crop module is applied automatically to the image. 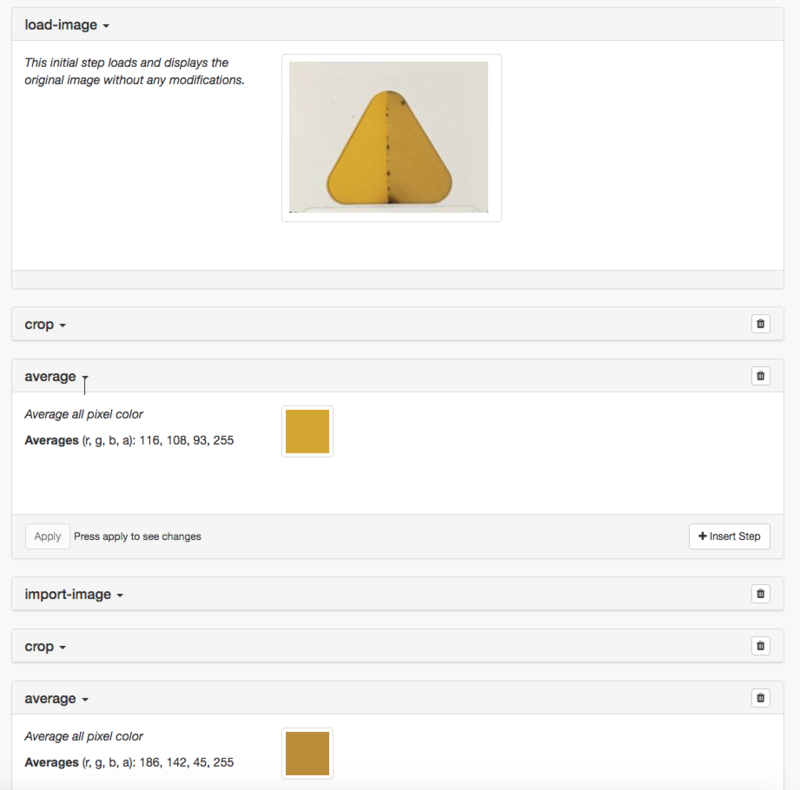 After the image is cropped, that means as soon as the user applies the changes for the crop, average module is applied. At this step we can store the red channel avg value. Once this is over we can trigger the import-imaage module and then again simlarly steps 3 and 4. At last we can display the raio in a simple box or some suitable UI field. What do you think upon this? I can work on the UI. I can also help with the algorithm. I can also GPU accelerate it if needed. If we have similar images, we can select settings for one of them using the UI, we can parallelize colorimetry on all the images including the forst one after that. Paralellization can be done on a gpu. Thoughts? @jywarren please transfer this issue to the colorimetry repo so that we can discuss there. @jywarren what are your views upon this? @jywarren please share your opinion !! I left some notes in publiclab/colorimetry#1 that may be relevant! Let's try to stay in sync by opening a few issues over there? I think it's possible to do a bare-bones UI with an image select and a display of the 2 numbers (and the ratio maybe? ), with an example image of how you should photo the test badge. Let's build out some issues over there! Thanks! @jywarren GitHub has a transfer issue feature. Transfer this issue there.